President Moon Jae-in on Thursday expressed "deep regret" over the dispute over the building of a naval base on South Korea's southern resort island of Jeju in a move widely seen as the first apology by a sitting president. South Korea selected Gangjeong, a small fishing town on the island's southern coast, as the site for its naval base in 2007 when Moon was chief of staff for liberal President Roh Moo-hyun. The project touched off angry protests from village residents and activists on the ground that the base could set off a regional arms race and damage the island's environment. The construction of the Jeju base was completed in 2016. On Thursday, Moon offered consolation to residents in Gangjeong as he met them in the village after attending an international fleet review that took place in waters off Jeju. "There should be procedural and democratic legitimacy even in a matter of national security, but it was not the case," Moon said. 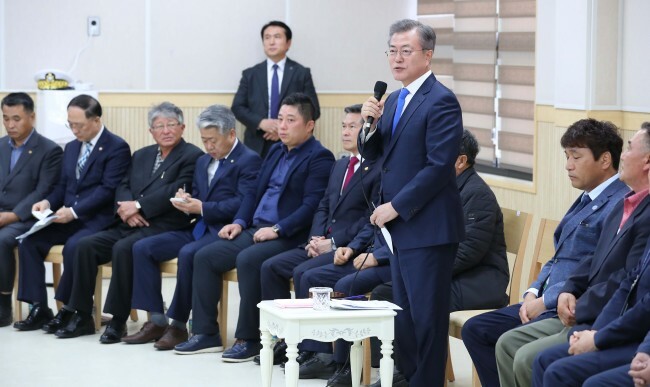 He also called for efforts to reconcile and heal the wounds of Gangjeong Village, noting the local community had collapsed due to deep divisions over the project. Last year, the South Korean government dropped a lawsuit against residents of Jeju Island and activists for having obstructed the construction of the naval base in what it called a decision to promote national unity.